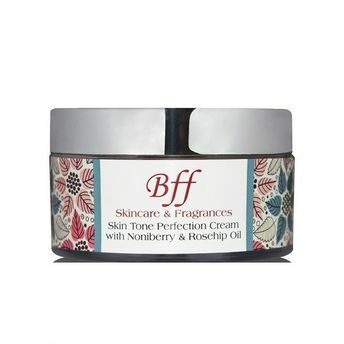 Be always camera-ready and look flawless with BFF Skin Tone Perfection Cream. Made using ingredients produced by mother nature, the cream feels light and natural on face. It provides your skin enough nutrition, hydrates it and balance it's tone and texture. So what are you waiting for? Include it in your skin care regime to fill and blur imperfections. Noni Berry: Superfood parched with Vitamins, Minerals, Essential Fatty acids & Antioxidants. It is the best treatment for all skin types, promoting even skin tone. Rosehip Oil: With its amazingly high concentration of Vitamins & Essential Fatty acids. It enables a vibrant glow & even complexion.